As the nation turned its back on Labor, Warren Snowdon held Lingiari – how come? Has there been a convincing emphasis, in the CLP campaign, on the opportunities of leasing Aboriginal land? And does the Alice Springs Country Liberals branch need new blood? These were some issues raised by ERWIN CHLANDA with the president of the Country Liberals, Darwin architect Ross Connolly (pictured). NEWS: What are the main objectives of the Alice Springs branch? CONNOLLY: We have a central council meeting coming up and if the branch wants to bring up policy matters, it can. We work with the Coalition, of course, and the chance for the Country Liberals to have a significant effect on policy is reasonably small. It’s even less so when you reduce it down to a branch, particularly without a sitting local member. Nigel Scullion is representing the whole of the Territory and he can take in issues the Alice Springs branch brings forward. NEWS: Senator Scullion, with just the one – hugely important – portfolio, has a big say over the sector of the population which causes the greatest concern in Alice Springs, and for which Canberra has disproportionate responsibility. Surely, there will be an opportunity for Alice Springs to get some of its problems solved, such as law and order issues and alcohol abuse. CONNOLLY: These are largely Territory Government issues, and it might look to the Federal government for a bit of support. You do have a lot of local representatives in the NT Parliament and indeed, the Chief Minister. If Alice Springs cannot get its issues before the NT Assembly then it is not trying. NEWS: On the other hand, Aboriginal land rights and leasing of Aboriginal land are Federal matters, and clearly, there need to be changes if a genuine Aboriginal economy is to be created. More and more people see this as the way out from the sloth of passive welfare. These issues were touched on in the Federal campaign but, in your view, to an extent that was adequate? Aboriginal people have freehold possession of half the NT’s land mass. It is a huge asset. CONNOLLY: We have not come up with anything new in recent weeks and we haven’t had a meeting to do so. The NT Government and Nigel Scullion support that inalienable Aboriginal land is made available through 99 years leases to Indigenous people and other investors, making it possible to borrow money against the leases, to start businesses and home ownership that other Territorians take for granted. It can put an end to the situation where Aboriginal people are asset rich but cash poor. That commitment has been there from the NT and the now Federal government for some time, to help Aboriginal people to make their assets work for them. NEWS: Was that point made strongly during the campaign by Ms MacFarlane, do you think? CONNOLLY: I couldn’t say. I wasn’t present for the whole campaign. It’s something the NT Government has been supporting quite strongly, to restore Indigenous dignity and pride, to become healthier and better educated. Ultimately, it’s for the benefit of the Territory. This has never been out of the picture. Now it’s a matter of sitting down with the Indigenous land owners and financing institutions – and lawyers, obviously. It’s a fairly radical change from where we’ve been in recent decades. NEWS: It’s well known what Warren Snowdon does in the bush before elections: he hands out public money for purposes whose usefulness are rarely examined down the road. The media releases on his website show that. This has worked for Mr Snowdon the best part of three decades. What did the CLP offer Indigenous voters in the 2013 campaign? CONNOLLY: That’s the advantage of an incumbent in government. He has access to funds and can promise all sorts of things. It’s obviously more difficult for him now that the Labor Party is not in government. Where he can make good on some of the promises he’s made remains to be seen. Pork-barelling is a regular feature in the lead-up to elections, particularly in the bush seats, a sponsorship here and subsidy there. NEWS: What did the CLP do to counter that? CONNOLLY: Opposition announcements were made, usually in conjunction with Tina MacFarlane, commitments such as roads funding, to be undertaken should the Coalition win government, or Tina win the seat. These projects are now on the public record. NEWS: There are about 32 bush booths, all except two won by Snowdon, and many in areas where the CLP had been successful in the Territory election. It’s clear you do well when you stand local people in local areas but you do badly against Snowdon. CONNOLLY: It’s worth noting that there was another little chunk taken out of Warren Snowdon’s support. Each time he loses two or three percent, this time close to three percent two party preferred, it gives us more confidence in investing in the competition next time ’round. As the Territory Government we can deliver to the bush electorates the things that had been undertaken in terms of Territory politics. And now that we have a Coalition government in Canberra, we’ll see emphasis on the bush and assistance to Indigenous people generally that, hopefully, will have a positive effect on bush voters in the next Federal election. The foreshadowed emphasis on the development of the north, and the fact that we have Nigel Scullion as the Indigenous Affairs Minister, will create a good climate. NEWS: Compared to the national vote the swing against Snowdon was small. NEWS: Are you likely to select the candidate earlier in the term? CONNOLLY: It’s very much an open question. There are pluses and minuses associated with early preselection. It is a tough life for a candidate. Unless you have a candidate who has the financial and personal resources to spend their life campaigning, it’s really hard. Some people who might be good candidates might run businesses, or be in employment that precludes long-term campaigning. NEWS: The CLP branch in Alice Springs is widely seen as committed but not passionate. It’s been in the hands of more or less the same handful of people for a long time. Do you see a need for change? New people, younger people? CONNOLLY: We’re always looking for younger people in the entire party. We’re actively trying to achieve this. It’s a party that is just on 40 years old and there are people who have been there almost the whole time and are now getting on. There needs to be a balance between people who held the reins for a long time and [those] who can bring youth and vitality to it. The party’s vice-president from Alice Springs is a young bloke, he has plenty of energy. NEWS: How many members does the Alice Springs branch have? CONNOLLY: I don’t have the number to hand. NEWS: Would there be merit to have branches in places like Yuendumu and Papunya? CONNOLLY: A branch needs to have a critical mass to be viable, and that may be as few as 10 members. We’re a grass-roots driven organisation. We would encourage the formation of branches where there are enough people to do so, particularly where it is supported by a strong MLA. A lot of remote people have joined other branches. NEWS: In the early days of Paul “Porky” Everingham, Jim Robertson and Grant Heaslip, if you went to a CLP function in Alice Springs there were 200 or 300 people there. I went to the election night party on September 15 and there were no more than a dozen people. CONNOLLY: People were exhausted. It was the price of a long campaign, some nine months. People were out bush polling, stuff like that. And it was always clear there wouldn’t be a result on the night in Lingiari. 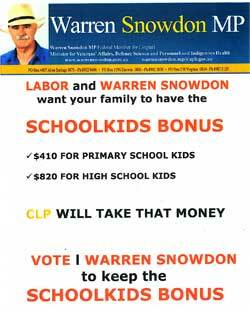 IMAGE: Handouts remained front and centre for long-time Member for Lingiari, Warren Snowdon. You picked the wrong party on election night Erwin. Re Warren Snowdon’s longevity in Federal Parliament. For me he is just a ‘junior’ compared to the federal liberal NSW MP Phillip Ruddock. Dear Phil has been sitting since the 1970s! Mr Snowdon has been in Parliament long enough to pick up the massive pension available to all politicians who have served three terms. He’s also long in the tooth. I’m surprised he didn’t walk away and enjoy the rest of what life has to offer and not volunteered for another period of tension and fighting between the indigenous lobby and government. He’s either a brave man or a tad silly. From a purely Alice Springs perspective, I wonder what the CLP thinks about beach volleyball. Adam? Robyn? Matt? Interesting that Ross has a less jaundiced view of Warren than you do Erwin. Mote in your eye?